by Rob Manning Follow OPB May 30, 2017 6:30 p.m.
Portland Mayor Ted Wheeler acknowledges he has little ability to stop two planned right-wing protests in Portland in the wake of last week’s TriMet stabbings. But he says he still hopes event organizers will rethink their timing. 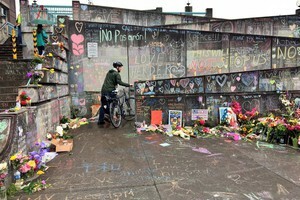 Wheeler has asked the federal government to revoke a permit for a June 4 free-speech rally at Terry Schrunk Plaza, which is federal property, in downtown Portland. He also wants the feds to refuse a permit for a June 10 anti-Muslim rally. The ACLU of Oregon has disagreed with Wheeler’s call, saying it amounts to censorship. The mayor said federal officials are unlikely to block the events. He said he’s talked to organizers and possible counter-protestors about how to avoid violence if the rallies do happen. Portland has been rocked by a series of rallies and counter-demonstrations since the election of President Donald Trump last fall. The suspect in the TriMet killings was at one recent protest, where he was seen shouting racist remarks and giving Nazi salutes.